Our day got underway as we said "have a good time" to Donna and Keith, while they sailed off in the Galactic Mariner in search of icebergs. As they vanished out of sight, Sharon and I started about our business, hanging around Gillott Cove for a bit longer, but only until our mood set us off into a different adventure. 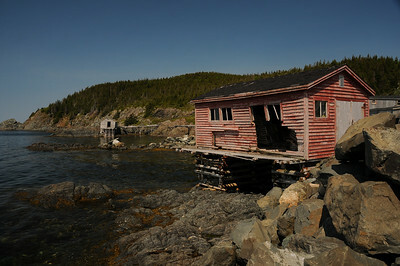 Ragged Point was one of our stops of choice during the return back to Twillingate. 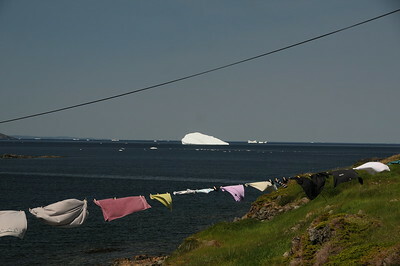 Great closeup views of icebergs was only one of the benefits for our detour. 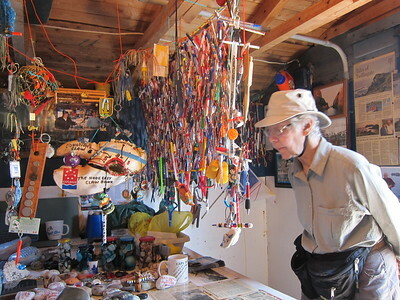 Later we paid a visit to Mel, the retired fisherman. 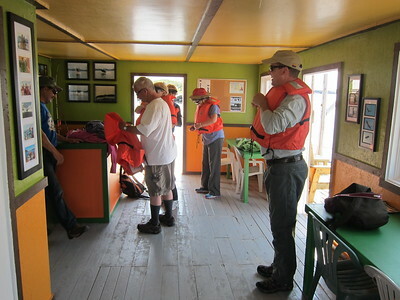 Mel was more than willing to spend some time with Sharon and I, chatting about things retired fisherman chat about. 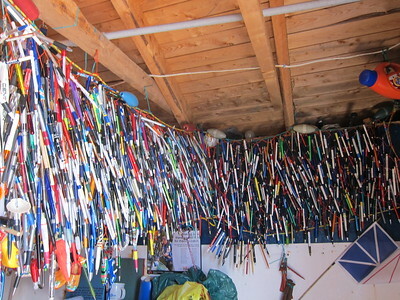 Things like all his treasured collections, or how to toss a fish net. Take a few moments to view the websites below. 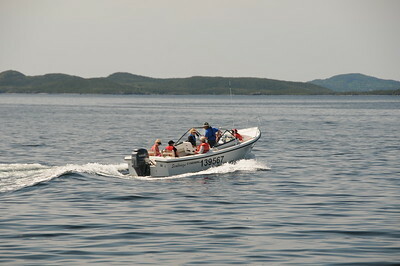 The two on capelin are interesting. 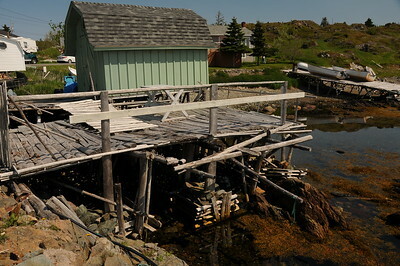 Capelin Rolling is a 1948 documentary on the capelin fishing industry in Newfoundland--it didn't look too promising back then. 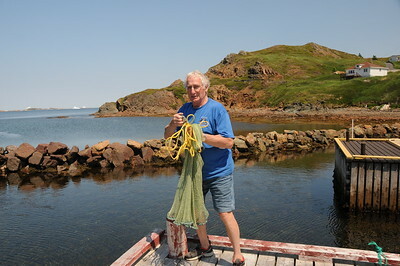 Capelin Time by the Dunne Family is real footage of the Dunne Family capelin fishing and the throwing of the net, just as Mel is doing in the photograph he is holding with Sharon. 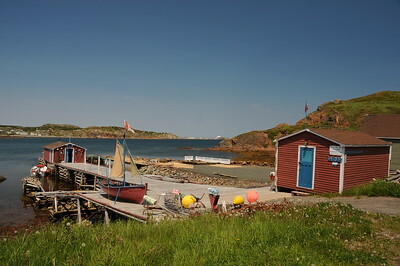 And if that's not enough, you'll be entertained by some fun Newfoundland music as well. 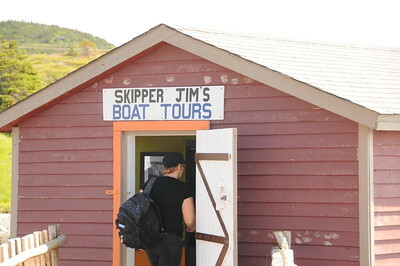 Standing on the wharf next to Skipper Jim's, Sharon is awaiting the arrival of our two friends. 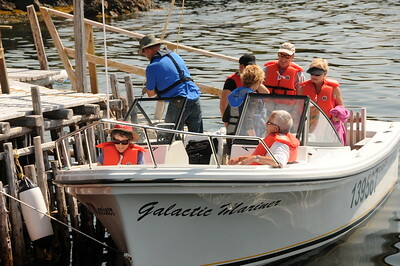 Keith and Donna are joining in with four other like-minded folk, who are heading out into Gillot Cove in search of icebergs. 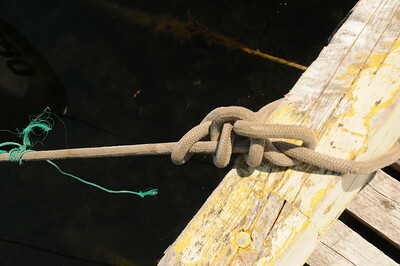 As soon as this complicated looking knot is unravelled, the Galactic Mariner and her passengers will shove off. Now it is time for us to get our day in gear. As our friends disappeared around the point, Sharon and I settled for a bit of sightseeing. 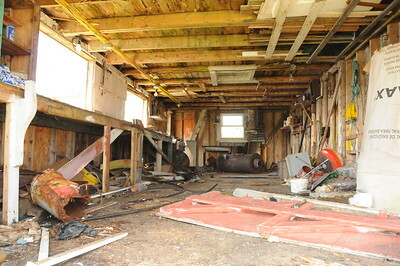 I did consider for a brief moment, of venturing out past the far shed, just to see what there is to see. 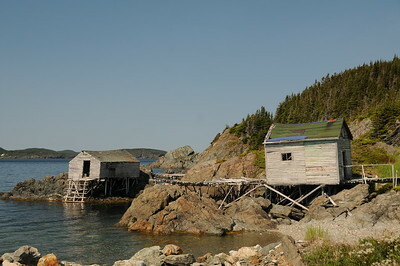 Holes are purposely punched into sheds, called stages, so the fishermen can bring their boats along side, at high tide of coarse, and throw their catch of the day inside for cleaning. This stage is not serving the purpose for which it was intended any longer. I am not sure a cat would feel safe walking the length of this wharf. I did however walk out onto this platform, and it felt surprisingly steady. On our way back from Slipper Jim's, Sharon and I drove out to Ragged Point. We turned into a nondescript pull-off area across from this century old house, and meandered a short distance out to the point. 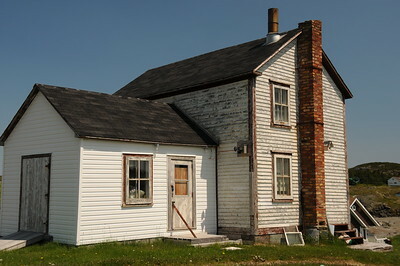 The owner who was born and raised in this old house, like two generations before him, has built another home next door. 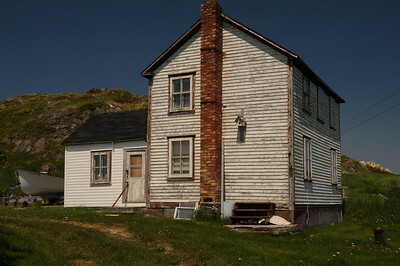 This house is closed up now, but it would've been an experience to have taken a nostalgic look-see through the rooms. Looking out from Ragged Point. In order for a chunk of ice to be classified as an iceberg, it must be larger than sixteen feet across. 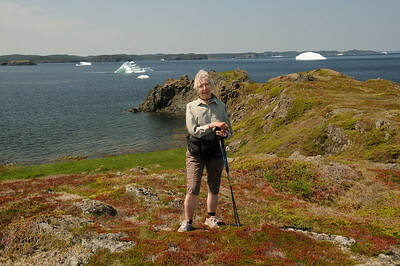 A bergy bit is less than sixteen feet. A growler is smaller than a bergy bit, and is similar in size to a grand piano. 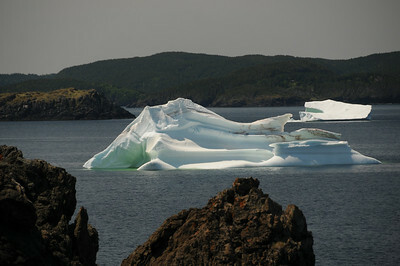 Some of the larger icebergs that float into shallower waters plough trenches into the ocean bottom, eventually anchoring themselves. Their fate is now sealed, and they will remain stationary until they dissolve. The landscape that stretches across Ragged Point is for the most part populated with ground-hugging vegetation, such as you saw in the previous photo. But obviously not all plants adhere to the "lets lay low" attitude when it comes to surviving the constant winds that blow in from the cool Atlantic waters. 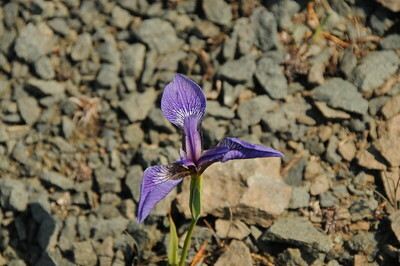 The wild iris is found throughout this small plateau, growing in clusters of small communities, or going it alone such as this individual. 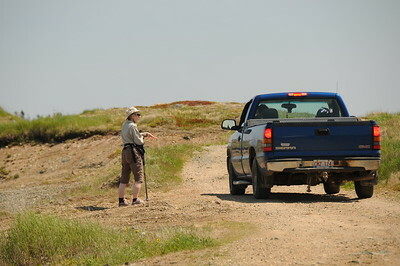 A local resident stops for a chat, and gave Sharon a brief history lesson of what Ragged Point is all about. 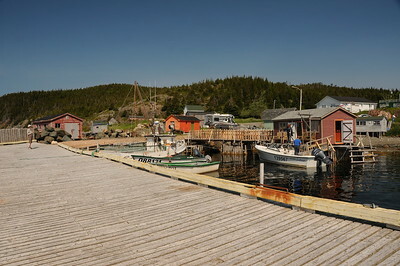 Chatting with Donna and Keith earlier on, Sharon and I learned of Mel the retired fisherman. So on our way home Sharon and I stopped in to see Mel, in hopes of catching a "fish tale" or two. 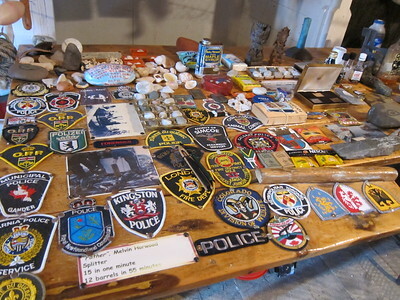 Mel spoke passionately about his large collection of souvenirs that he has collected from people he has met over the years. 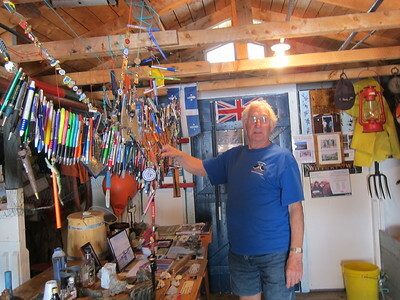 His pen collection for instance, has accumulated from visitors leaving them behind as souvenirs, or folks who have met Mel and mailed him a pen when they returned back to their homeland. It appears Mel has had his share of run-ins with the law. Lots and lots of pens. And of course no fisherman would be worth his salt if he didn't have a "fish tale" or two. 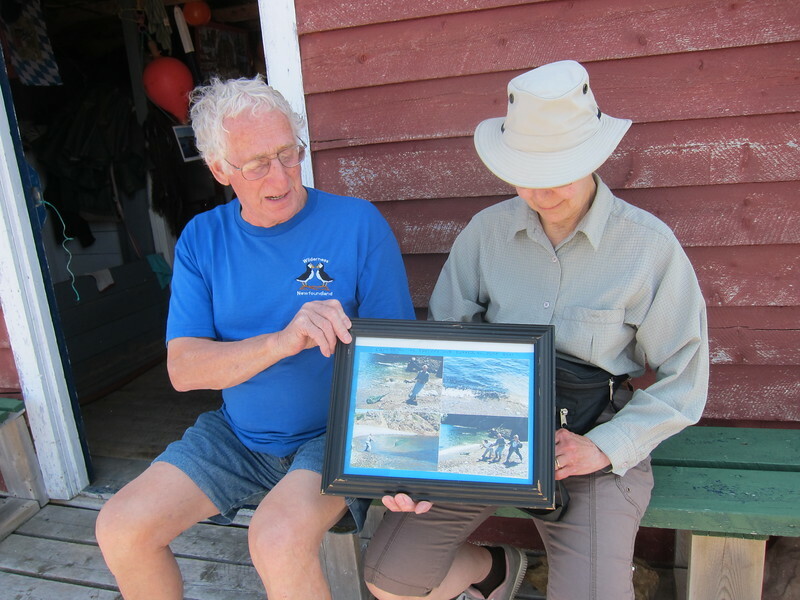 Mel demonstrates how he tossed a fish net during capelin rolling in 2001. Check out the picture Mel and Sharon are holding in the previous photograph.